New V2 pack is made with state of the art to remove all wires except for the wire bonds. Cast in clear resin so you can see the beauty of american manufacturing. This pack is made with love in El Segundo California. This is the most advanced Luna Cycle battery pack to date. It uses an ultrasonic wire bonding method (same as Tesla uses) and the most advanced 18650 cells potted in a high tech epoxy. Because our packs are made in the USA we can make sure that the cells are genuine grade A authentic cells. The Samsung 30q is a great cell known for it's high discharge rate and good range, while the Panasonic GA has a slightly lower discharge rate but a longer range. The Wolf Pack uses a unique magnetic mounting system. You simply attach two magnets to where your battery bottle would screw in and the wolf pack clings tightly to the magnets. The pack is easily removable by just pushing sideways on the top of the pack. The magnets are very strong. in fact you can pick up most bikes by just the hold of the magnets. The only easy way to get the battery off is by tilting it sideways. 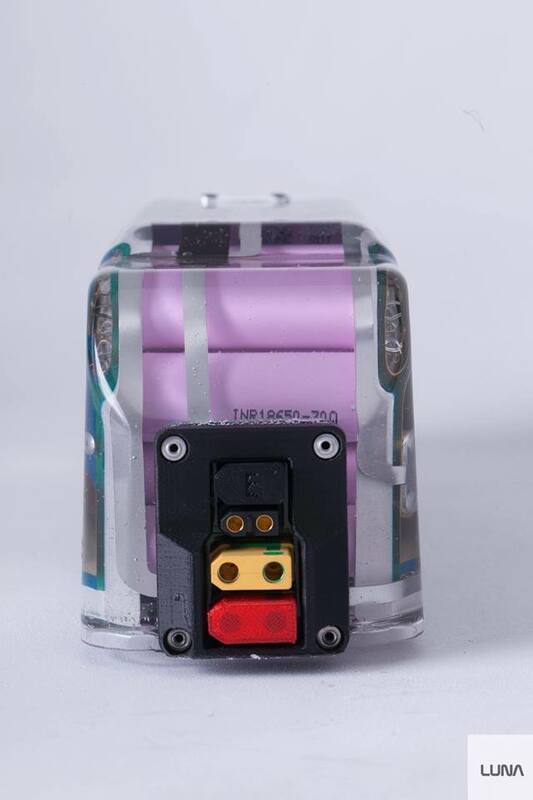 One thing we hated about the shark pack was the connectors were not capable of high power and would occasionally make weak connections which would cause them to melt and need to be replaced. The Wolf Pack uses XT-90 with spark resister (it does not spark when you plug it in) and an XT-60 for the charge leads. These connectors make the pack easily removable and at the same time make a very solid connection. We use an advanced made in the USA Polyurethane which makes the pack safer, collision proof and water proof. This is the only ebike pack we know of to be completely safe to ride in the rain. We use an ultra sound welding technique to bond all the cells together which is a heatless process which is the safest way to join cells into a pack and the same method that Tesla uses. This offers real single cell fusing so that if one cell fails or short circuits it will not damage the rest of the pack. This is the most advanced ebike battery on the market. Each battery is tested before it leaves our facility to ensure it is 100 percent the capacity and that all of the 56 cells are authentic and in perfect condition. We are offering this clear as liquid battery at a very low introductory price. Naked packs will only be available for a short time until our black packs are done. Naked is a limited release edition for daring luna-tics only. All naked packs will be signed by Luna founders Eric and Ashley on the bottoms of the pack where nobody can see. I really appreciate the unique work you do. I'm also trying the XT90.